The next video is by LisaOnTheGo as a meditation of the Ho'Oponopono. Listen and watch both today and as often as you need or want. Ho'Oponopono is one of the first tools LisaOnTheGo learned prior to her spiritual awareness journey that made a difference in her life. Ho’oponopono is the Hawaiian ritual of forgiveness, and it belongs to an ancient system of teachings called Huna (Hu=Knowledge, na=represents Wisdom). Ho'oponopono is a ritual of forgiveness and to your inner peace. LisaOnTheGo says Ho'Oponopono is done in many ways, as a: meditation, prayer, song, words, thoughts, however, it works for you. They're no right or wrong ways how to process the Ho’Oponopono. For LisaOnTheGo it's Spirituality. Spirituality means being in your spiritual heart and in the moment, in the present, no past and no future in thoughts. it's being in the here and now. These words are for us to release and forgive ourselves and others. Through 4 simple sentences and effort of applying the Ho’Oponopono can help bring us to our inner peace. Through 4 simple sayings and effort of applying the Ho’Oponopono can bring us to inner peace. Many years ago LisaOnTheGo was given the Ho’oponopono words and explained when feeling triggered, upset, angry to say these words and mean them. She Visualizes the other person that she has a negative emotion with and say the Ho’Oponopono words. You know what? It works, LisaOnTheGo can't explain how or why but it worked to start bringing her inner peace. These sayings helped her to forgive others and herself. The feelings of inner peace began. 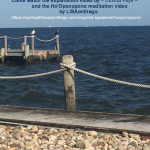 The first video explains the effects, thought processes and benefits that come forth with the Ho’oponopono and the next video is putting the words into practice with a Guided-Meditation by LisaOnTheGo. Say the Mantra while listening to the water and feel your inner peace.